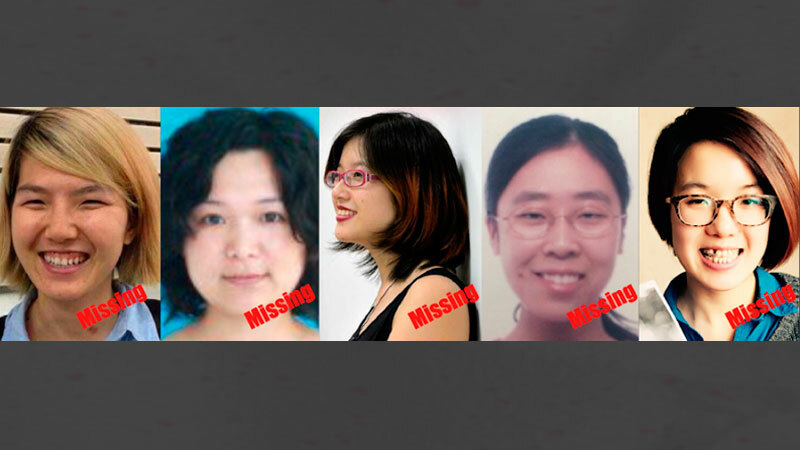 The five young women who were arrested by Chinese police ahead of the International Women's Day  have now been missing for more than one week. On 12 March they were criminally detained on suspicion of “picking quarrels and provoking troubles” but the police refused to reveal further information. A spokesman for EU Foreign Affairs and Security Policy also made a statement  urging China to release the young feminists immediately and to give them access to legal assistance. Despite hostile political conditions, women, students and workers’ organizations from mainland Chinese  continue to speak out for the release of the five by uploading photos on social media and signing petitions. Outside China, feminist and civic groups from all over the world have condemned the Chinese authorities’ brutal crackdown. Amnesty International has launched a campaign page on Tumblr  and a Twitter tag #FreeTheFive to collect supporting messages and pictures from all over the world. 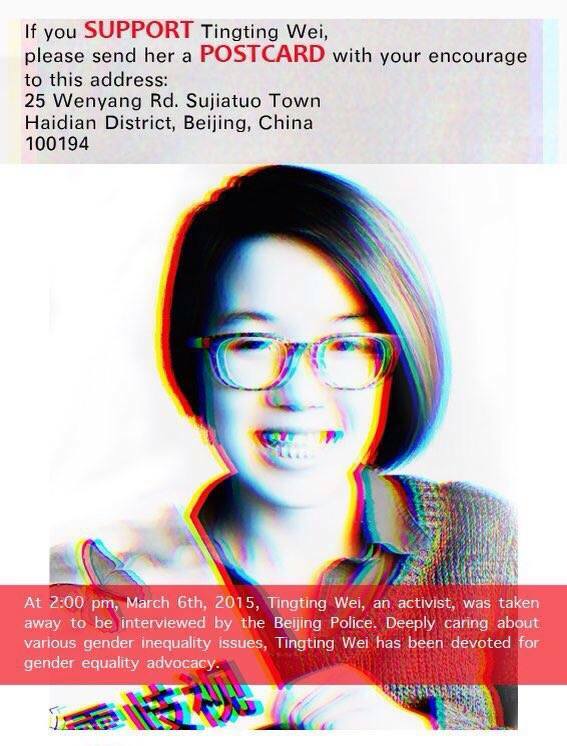 Ad hoc feminist group, Free Chinese Feminists, launched a signature campaign  and a postcard campaign . The group urged supporters to send the postcard to Beijing police demanding the release of the Five. In Malaysia, a country with a large Chinese population, 26 organizations from local civil society co-signed  a statement condemning the Chinese authorities and expressing concern over the safety of the young feminists. Taiwan feminist groups expressed their outrage over the arrest and urged their President Ma Ying Jeou  to include issues related to human rights and gender equity onto the agenda of the cross-strait dialogue. Since Chinese authorities continue to play dumb amid criticism, a number of civic groups in Hong Kong have decided to protest  in front of the Liaison Office of the Central People's Government and present a statement signed  by 50 local civic groups and 2,500 individuals on March 21. Currently the 59th session of the Commission on the Status of Women is taking place at the United Nations Headquarters in New York  to review the challenges that affect the implementation of the Beijing Declaration and Platform for Action , which stands for gender equality and female empowerment. 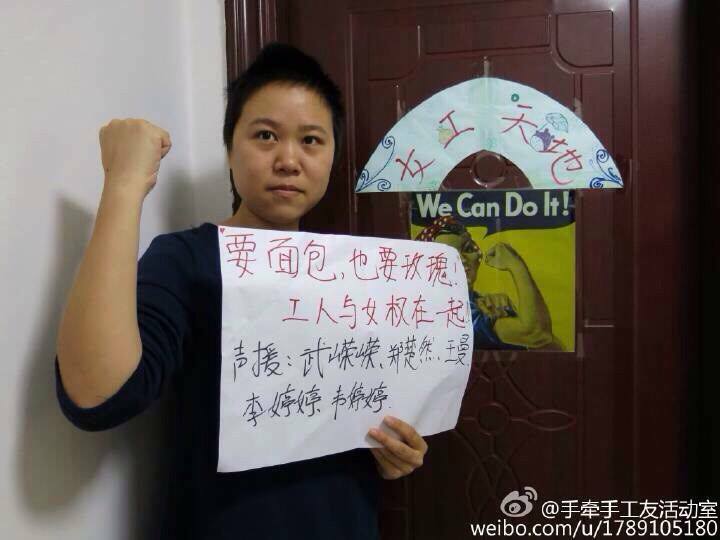 The detention of the five feminists in Beijing has now become a case study on the barriers to achieving those aims.